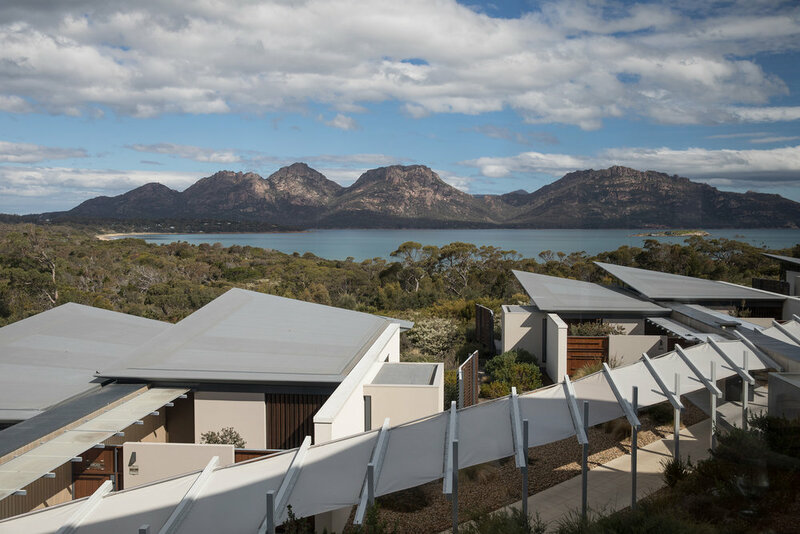 Secluded above a private, glimmering beach and facing Freycinet Peninsula’s picturesque granite mountain range, The Hazards, Saffire Freycinet is one of Australia’s most exclusively located lodges. Trundling down a gravel lane, the hotel reveals a glimpse of itself. 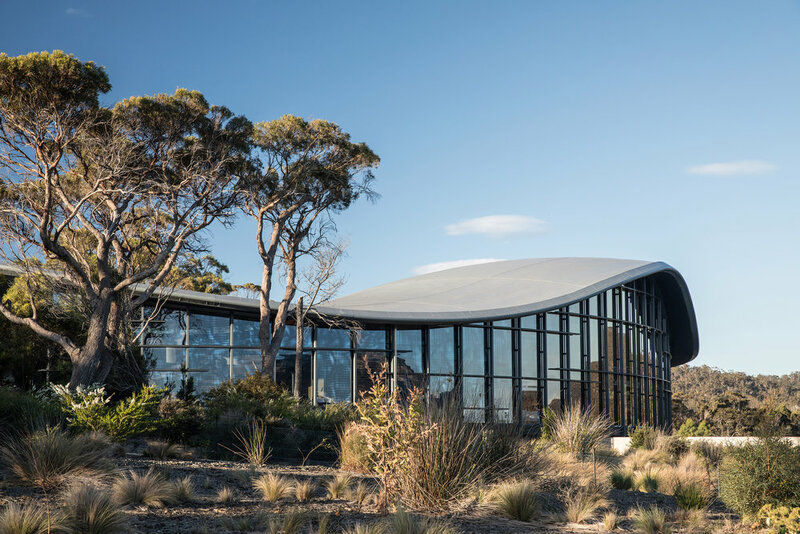 Nestled in native bush surroundings, Saffire Freycinet was designed in the shape of a stingray where you enter from the long tail in to the belly of an architectural masterpiece. A curved wooden roof conceived of hundreds of panels of celery top pine frames a light filled space filled with Eames loungers and opens to an unobstructed view of the bay. You’re greeted with a glass of Tasmanian sparkling before being escorted to the lounge for lunch. Lunch is a casual spread of fresh, mixed salads with the option to order off a small menu of light options like fish or duck leg. Teamed with a glass of local wine we’re ready to relax in our suite. There are only 20 suites at Saffire Freycinet all of which face The Hazards with floor to ceiling windows. Ours has a plunge pool, which is great to cool off after a hike to nearby Wineglass Bay. There’s a fully stocked, complimentary mini bar which is filled with chocolates, nuts, crisps, wine and beer and the patio is complete with sun loungers and is the perfect spot to sit with goodies from your kitchen. Late afternoon we head off on the lodge’s signature Oyster Farm Tour. Dressed in waterproof overalls and boots, we wade out in search of oysters. 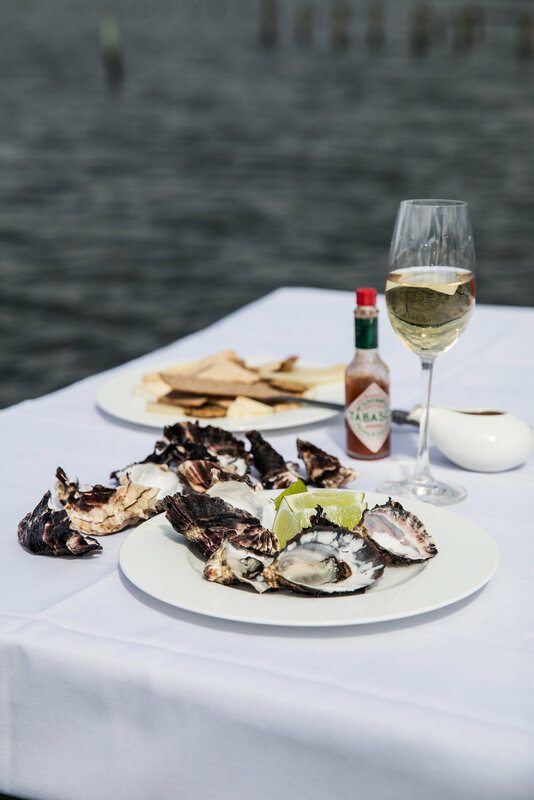 Standing at a white-cloth clad table out on the water, we shuck our freshly picked treasures and sip on a glass of sparkling. They’re best eaten naked, or with a dash of lemon and are truly some of the most outstanding oysters in the world. We arrive back for cocktail hour and settle in the lounge to take in one of the most spectacular sunsets in Tasmania. As the sun drops the granite turns a deep red and all the guests are mesmerised by the phenomena. After sunset we’re escorted to our table in the dining room and are presented with a culinary journey of some of Tasmania’s best produce. A butter and tomato pasta is fresh and delicious (so much so we ask for a second serving) and local lamb dish melts in your mouth. Service is flawless, with staff picking up on every detail. A Shiraz which we raved about at dinner somehow magically appeared bed side for us upon our return and we were even given insider tips on how to capture the landscape at night on our cameras. Come morning following a light breakfast we’re off to hike the parklands. There are many walks and hikes in the national park within a short drive of the lodge and range from easy to intense to suit all travellers. We power up the short trail to a jaw-dropping view of Wineglass Bay, one of the most pristine, perfect beaches in the world. It’s also a great spot for keen bird watchers. Post-lunch we’re off to see the lodge’s own free-range enclosure for the Tasmanian Devils. The species has been considered endangered for over ten years due to a highly contagious facial cancer and this enclosure reflects their natural habitat and is a safe haven for a group of healthy marsupials. We visit during feeding time and they come bounding up to the rangers. They’re actually quite adorable, despite fighting each other over their fresh kill dinner. 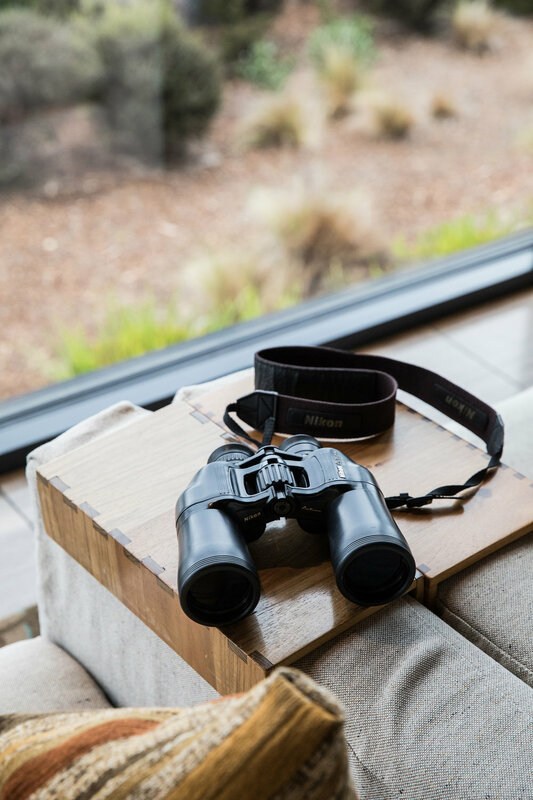 By staying at Saffire Freycinet you’re contributing to the wonderful work they do at the enclosure to ensure the longevity of healthy Tasmanian Devils. Late afternoon we’re ready for a massage. The lodge’s spa is beautiful, with expert therapists easing aches and pains in a tranquil room and you can relax in a deep stone bath post-treatment overlooking native landscaping with tea. Winding down for day, it’s time to head back to the lounge for another sunset and cocktail. Sipping on a Tasmanian gin and tonic, The Hazards light up right on cue. We all sigh in unison and take in one of the most stunning views in Australia. LOCATION: In the Freycinet Peninsula, just two and a half hours' scenic drive from Hobart and two hours' drive from Launceston. CHILDREN: Yes by prior arrangement. RESTAURANT/BAR: All meals are included with your rate and dietary requirements can be accommodated for. RATES: Starting at $1980, twin share, per night including meals, beverages and some excursions. ROOMS: 20 suites all offering uninterrupted views over The Hazards. MINI BAR: Complimentary. Beer, wine, sparkling, soft drink, chocolate, biscuits, nuts, crisps and water. POOL/GYM/SPA: Some rooms have a plunge pool and there’s a full service spa and gym. TURN DOWN SERVICE: Yes, water refilled, snacks. I was a guest of Saffire Freycinet.